Atlanta, GA, USA, October 26, 2018 – Atlanta DTH, an internationally active leader in the development and provision of media-related telecommunication systems, announces that the DGI 1011 DTV interface is now deliverable. Debuted at the Broadcast Asia 2018 show in Singapore, the DGI 1011 is an ultra-compact plug-in dongle which allows TOLKA network subscribers to view free-to-air or pay-TV on smart devices such as mobile phones and tablet computers. The DGI 1011 incorporates a digital terrestrial television tuner and demodulator which enables free-to-air content viewing without eating into mobile data allowances. Compatible with Android 5 or higher, it can receive high definition or standard definition TV channels. Tuning frequency range is 47 to 862 MHz and channel bandwidth is 6 MHz. An integral CA decoder gives viewers the option of watching secured DTV content on the same direct-reception basis. A wide variety of video formats can be handled, including MPEG-2 MP@HL and MP@ML, MPEG-4.2 ASP@L5 (720p), H.264 (MPEG-4.10) BP@L3, MP@L4.1 and HP@L4.1 with up to 1080p@30fps resolution. Compatible audio decoding standards include MPEG-1, MP3 and MPEG4 AAC, with dual language support (dual audio input) and Dolby AC3 surround-sound pass-through. Measuring only 5 x 3 x 1 cm, the DGI 1011 interfaces to the host via a standard USB 2.0 port. It comes complete with a miniature plug-in antenna which couples via a Type F connector. Operating temperature span is 0 to +40 degrees Celsius (32 to 104 degrees Fahrenheit). The DGI 1011 fully supports the ADTH TOLKA Watermark broadcast media content protection system which generates and inserts a digital signature specific to each customer’s viewing interface. Each digital signature is encrypted securely and invisibly within the transmitted TV content. 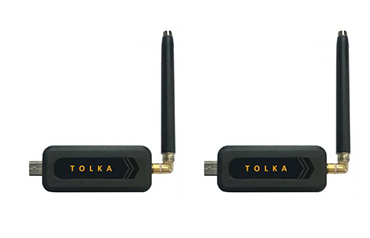 If suspected content is identified as an illegal copy made from a device on a direct-to-home operator’s network, TOLKA Watermark can match the associated content with the unique signature associated with each TOLKA receiver.